2017 Panini Chronicles Baseball is definitely unique. 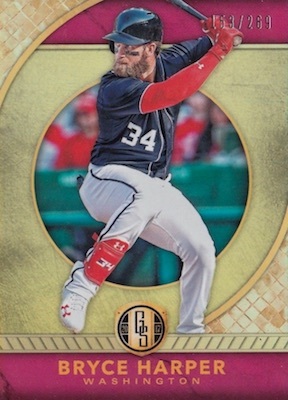 While it contains some cards that carry the Chronicles name, the debut MLBPA set is also a mashup of other established lines from Panini, including Absolute, Gold Standard, Spectra, and more. All of these combine to deliver four autographs or relics per hobby box. 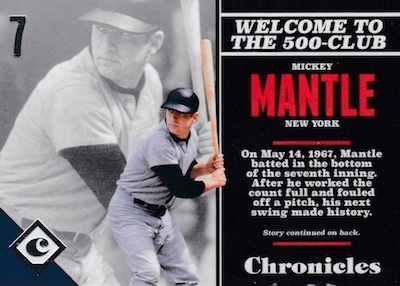 Up to seven different brands lend their style and substance to a 2017 Panini Chronicles Baseball checklist that is heavy on rookie content, but also works all-time legend Mickey Mantle into several sets. Worth noting, a few of these brands are making their first foray into baseball. Documenting the events of the game in great detail, the Chronicles base set has the rare design that features considerable text on the back and the front of the card, proving a narrative about the player in question. Of course, Mantle is part of the base set and there is also a rookie subset numbered to 499 copies. 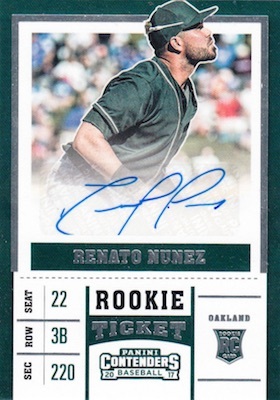 Other non-hit options include Absolute Rookies, returning for the first time since 2005, along with Donruss Rated Rookies, Gold Standard and Prizm, which has signed editions. First-year players really ramp up in 2017 Panini Chronicles Baseball with the rookie autographed relic cards. These include Absolute Rookie Premiere Materials Autographs, with a trio of relics, plus Contenders Rookie Tickets, and the accompanying Playoff, Championship and Cracked Ice Ticket parallels. 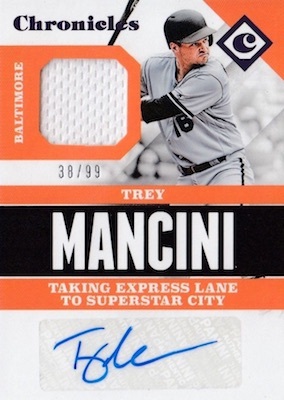 There is also the baseball debut of Gold Standard Rookie Jersey Autographs and Gold Standard Rookie Jersey Autographs Doubles (both #/199 or less), which are each hard-signed. Another first for the sport, the Spectra Rookie Jersey Autographs set showcases on-card signatures paired with an oversized swatch. There are also Spectra Signatures. Getting back to the main brand tying this all together, the Chronicles Autograph cards offer a wide mix of past and present stars using the same focus on details as the base set. Forming the other side of the hit equation, the 2017 Panini Chronicles Baseball memorabilia inserts take the form of Chronicles Swatches and Triple Threats Materials, which both include Mantle. Also a place to find Micky Mantle relics, the Absolute Tools of the Trade Materials line consists of Double, Triple, Quad and Five versions. 2017 Chronicles Corey Seager Auto Dodgers HOT! BASE PARALLELS: Gold #/999, Blue #/399, Green #/199, Purple #/99, Red #/25, Black 1/1. ROOKIES PARALLELS: Gold #/399, Blue #/299, Green #/199, Purple #/99, Red #/25, Black 1/1. PARALLEL CARDS: Gold #/99 or less, Blue #/25 or less, Black 1/1. All subjects not included in Gold parallel. View specific options with the spreadsheet. 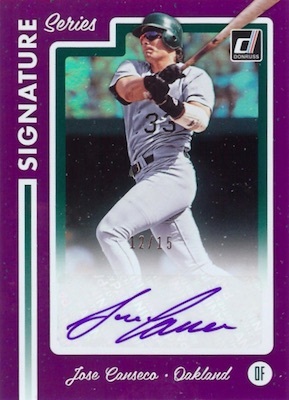 PARALLEL CARDS: Purple #/99 or less (No Gary Sheffield, Bryce Harper*), Red #/25 or less (No Andrew Benintendi*), Black 1/1. 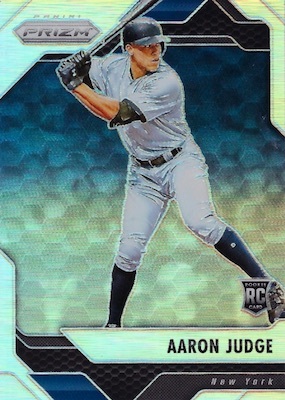 VERSIONS: Purple #/99 (Judge, Bregman - #/49*), Red #/25 or less, Black 1/1. All subjects not included in Purple, Red parallels. View specific options with the spreadsheet. PARALLEL CARDS: Blue, Spectrum Red #/49, Spectrum Green #/25, Spectrum Purple 1/1, Printing Plates 1/1. 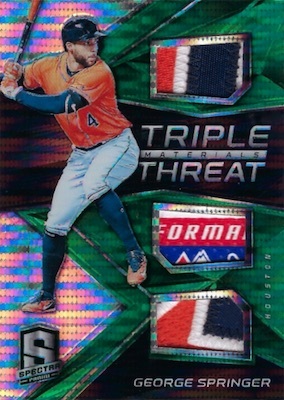 PARALLEL CARDS: Spectrum #/10 (Swanson, Bregman, Moncada - #/5*). PARALLEL CARDS: Prime #/15 or less. 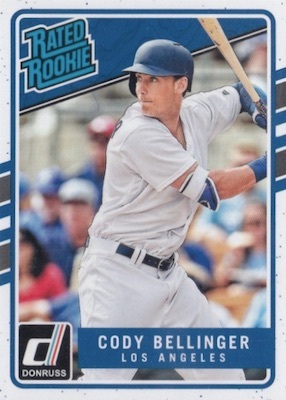 PARALLEL CARDS: Prime 1/1 (Bellinger - #/5, Judge - #/10). 5 cards. Serial numbered #/5. Shop on eBay. PARALLEL CARDS: Playoff Ticket #/99 or less (No Yoan Moncada*), Championship Ticket #/49 or less, Cracked Ice Ticket #/24, Printing Plates 1/1. PARALLEL CARDS: Cyan Back, Gray Border #/199, Gold Press Proof #/99, Aqueous Test Proof #/49, Pink Border #/25, Artist Proof #/10, Press Proof #/5, Printing Plates 1/1. VERSIONS: Blue #/99 or less, Red #/49 or less, Gold #/25 or less, Purple #/15 or #/10, Pink #/10 or #/5, Green #/5 or #/3, Black 1/1. 25 cards. Serial numbered #/269. PARALLEL CARDS: Blue #/79, Black #/15. PARALLEL CARDS: Prime #/25 (Andrew Toles - #/13; No Cody Bellinger*), Prime Tag 1/1 (No Andrew Toles*). 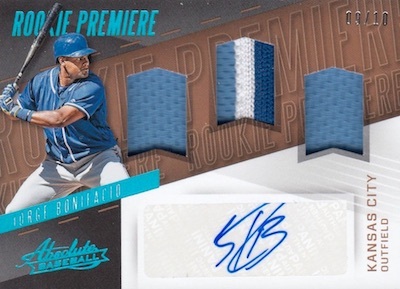 PARALLEL CARDS: Prime #/25 (Benintendi, Brinson - #/10; Bellinger - #/5*), Prime Tag 1/1. PARALLEL CARDS: Flash, Orange #/399, Light Blue #/299, Blue Wave #/199, Purple Scope #/99, Red Crystals #/75, Green Power #/49, Camo #/25, Gold #/10, Gold Vinyl #/5, Black Finite 1/1. 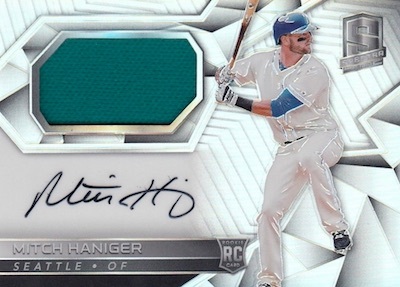 VERSIONS: Blue Wave #/49 (Brinson - #/40*), Purple Scope #/35 (Haniger - #30*), Red Crystals #/25 (Swanson - #/20*), Green Power #/20 or #/15, Camo #/15 or #/10, Gold #/10 (Swanson, Glavine, Lindor, Seager - #/5*), Gold Vinyl #/5 or #/3, Black Finite 1/1. PARALLEL CARDS: Neon Blue #/60 or less, Neon Pink #/35 or less, Neon Green #/25 or less, Orange #/3, Gold 1/1. PARALLEL CARDS: Neon Blue #/99, Pink #/49, Neon Green #/25 (No Benintendi, Bellinger*), Gold #/10 (No Bellinger; Brinson - #/5*), Green #/5 (Brinson - #/3*), Nebula 1/1. PARALLEL CARDS: Neon Blue #/99 (Kershaw, Dozier - #/49*), Pink #/49 or less, Neon Green #/25 or less, Gold #/10 or less, Green #/5 or #/3, Nebula 1/1. 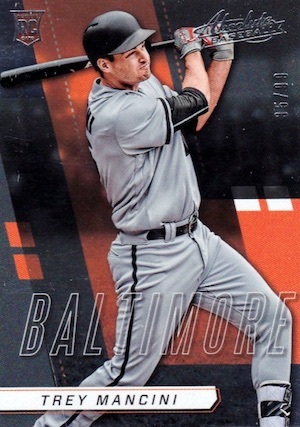 Hodge Podge of mess….base cards are way to busy…I actually pulled a couple of ok cards..1 box and done for me..
Great hits. The Spectra, Gold Standard and Prizm baseball hits are beautiful cards. While initially the base set seems like a mess, but after giving it some time I am really liking the “headline” look. Might just be the first base set I have put together in years. I was reminded of why I quit buying Panini products today. I do understand that the print run is “average odds” so I wasn’t that mad about getting down to the last pack with 3 not so good auto’s. I did save the super thick pack for last, and it was a Bellinger!!!! Then I flipped it over, not auto’d so what, I got shorted one, l can live with that. It was a dual patch #99, but dang???? We had an hour debate if the little piece of black rubber looking stuff was actually mem or a spot of glue. Not impressed with this product. Have been disappointed with Panini and (lack of) customer service anyway. In my opinion this product is not worth the price. Kurry, you weren’t shorted an auto. It’s 4 autographs or memorabilia per box. How can you say a $90 box with 3 autos and a relic is not worth the price? I think this is a great idea for a product, especially at the price point! Under $100 and 4 hits, it doesn’t get much better than that imo. Most of the boxes I’ve seen have 3-4 autos. Most products you would get 2 autos and 2 relics especially in a box under $100. Well done with this one Panini! This is the type of product I have always thought would be a good idea. I love the fact that Panini decided to take some of their sets that tend to be higher end and put them in as inserts in a mid tier product. The Spectra cards look amazing in person and the Gold Standard cards have that nice thick stock that really gives it a high end feel. I only opened one box of my own so far but it was a fun break with the inserts from different sets. The number of hits for the price also makes this product amazing. The base set is a bit busy but they definitely could be worse. 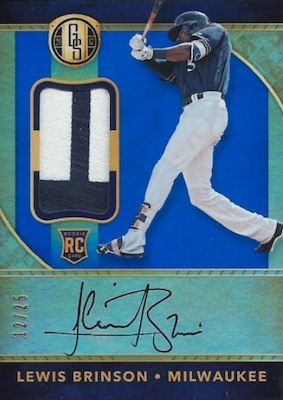 Are the Blue parallel Absolute Rookies not numbered? 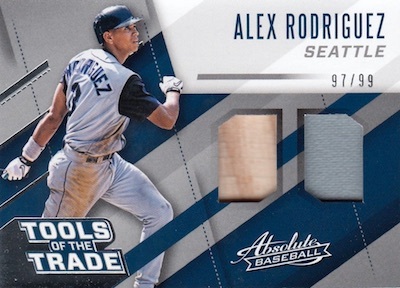 The Absolute Blue parallels are not numbered because they are a Blaster exclusive. 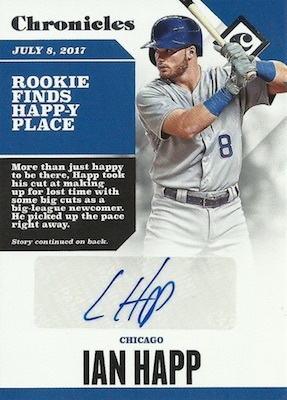 While at first I was not the fan of the landscape design and all the text, but after I watched a few breaks, I realized how nice some of the cards were with a ton of top rookies like Judge, Bellinger, Happ, and Mancini being pulled. For the $80 price point and 4 hits, I honestly think that this is one of the better products of the year, great job on this one Panini! This set rocks. it allows you to pull a big name player like bergman, judge, or bellinger without spending a ton of money. This product has the feel of a high end set with a lot of value in every box. I have pulled in two boxes, a margot autographed patch card, a bergman patch auto, and a beautiful hunter renfroe autographed patch card. I’m literally 22 boxes deep! I’ve pulled some amazing cards.. Spectra rookie jersey autos of Bellinger , Judge and Moncada.. 1/1 contenders plate auto of Derek Fischer.. Absolute autos of Judge/99 and a sick Swanson /20 .. Donruss sig series autos Gold Boggs.. Chronicles autos Benny, Pete rose, Todd Helton.. Contenders autos Happ , cracked ice Judge … Gold Standard autos Happ , Benny Healy with sick patches.. Spectra Triple Threats Moncada, Kershaw … I could keep going!!! Bought a box from my LCS. The box contained 1 auto, 1 jersey, 9 numbered cards total (including the jersey card) and you cant forget about the 3 blank thick decoy cards. I understand that it says “on Average” on the box, but come on now. I have a case open with Panini about it as i type. 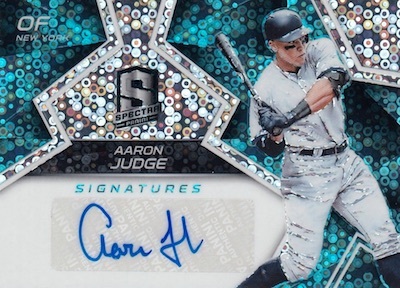 2017 PANINI CHRONICLES BASEBALL HOBBY BOX LOOK FOR AARON JUDGE ROOKIE AUTOS!